Measures relative moisture of various building materials including wood, particle board, carpeting, and ceiling tiles using non-invasive Pinless Technology. Simultaneous digital readout of moisture content plus ambient temperature or humidity with analog bargraph display of moisture, Max moisture values, and programmable wet/dry indication. Complete with protective cap, replacement pins, and three CR-2032 button batteries. 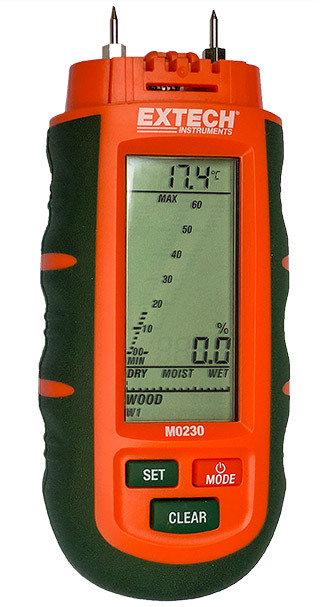 The 230 Pocket Moisture Meter measures moisture of wood and building materials. The built-in battery check and measurement verification test to insure accurate readings. LCD screen is optimized for a 30 degree viewing angle.